I have a recurring problem in the kitchen. I see a recipe, and I can’t help modifying it. I’ll start out with the best intentions, following a recipe down to the very letter; but halfway through, I’ll remember that unusual spice mixture in the cupboard, or that half-used can of coconut milk in the fridge. It feels like a spark of genius, in that moment, and I’ll declare my brilliance to anyone who can stand to listen: “I’m so smart!” The result may or may not turn out well, but at least I tried. Right? I don’t know why, but I even do this with recipes from trusted sources. You know, someone like Julia Child. I don’t think she’d mind; and I take an inordinate amount of pride in the fact that no one, not even myself, will likely be able to replicate most of my dishes ever again. I especially take pride in modifying baked goods, since there seems to be some odd notion going around that OMG you can’t modify baked goods at all, or the universe will explode. So after seeing this recipe on Smitten Kitchen, I just couldn’t resist. That name! It was just begging for me to fiddle with! What started out as arguably the simplest banana bread recipe I’ve ever seen (only one bowl!) has now, by my unrestrained and baroque hand (and Deb’s, from SK), become a tricked-out monstrosity. The ingredient list has nearly doubled, and it has gotten tarted up with spices, lemon zest, and booze. This simple and relatively rustic bread has turned into a mere shadow of its former self, none of it necessary in the slightest. I say none of the changes are necessary, and they aren’t, exactly; but that doesn’t mean they aren’t good. In fact – and take this with a grain of salt, because I have yet to try the original version – I think these changes are just what the doctor ordered. This bread is quite moist and very delicious, almost to the point where I may have a challenger on my hands for My All-Time Favorite Banana Bread Recipe (currently this one). It’s so good! This was one of those quick breads that’s actually a bit tricky to slice, as it’s so wonderfully tender that the slices simply crumble under the weight of the knife. This isn’t exactly a tragedy, since I personally think the bits that you eat off the cutting board just taste better. But if you can manage a slice, you’ll be rewarded with a pretty, slightly dark bread, dotted with white rhomboids of walnut. And even though I didn’t add a sugar topping, one seems to have magically appeared, giving each bite of top crust a fantastic crisp-sugar crunch. Thanks, oven fairies! 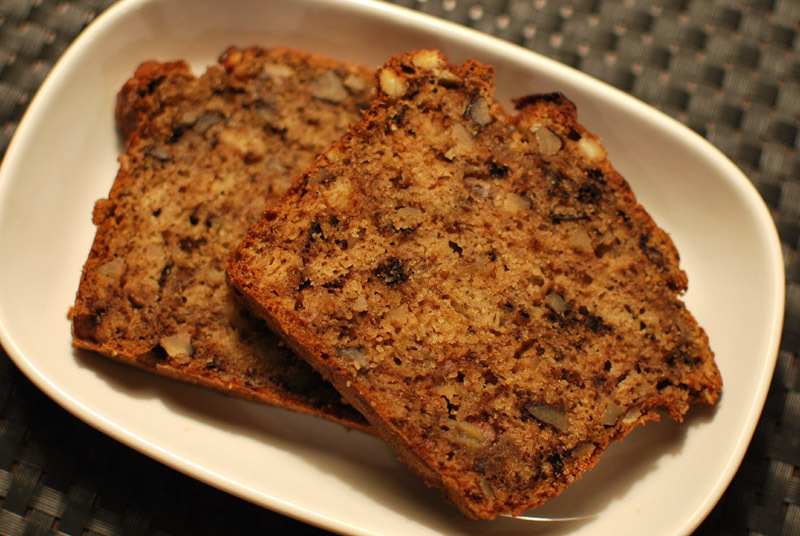 Some people have hard and fast rules for banana bread, mostly regarding the inclusion or omission of nuts, which can sometimes border on hysteric dogma. Personally, I don’t care if there are or aren’t nuts (both are good! ), but I demand cinnamon in my banana bread. Preferably lots. So feel free to take liberties with this recipe, as I did, and make it your own. Who knows? You may come up with something you like even better than the original! 1. Preheat the oven to 350° F. Butter and flour an 8 x 4 inch loaf pan, knocking to coat fully and remove excess flour; set aside. Whisk or sift the flour and spices together, and set aside. 2. With a wooden spoon, smash the bananas in a large mixing bowl. Stir in the melted butter. Add the sugar, egg, lemon zest, vanilla, and bourbon, and stir to combine. Sprinkle the baking soda and salt over the mixture, and mix in. Add the flour mixture, and gently mix until mostly incorporated. Add the walnuts, and fold until incorporated and all flour is just moistened. Be careful not to overmix. 3. Pour the batter into the prepared loaf pan. Bake at 350° F for 50 to 60 minutes, or until a skewer inserted in the center comes out clean. Cool in the pan on a rack briefly, then remove from the pan to cool fully on a rack. Best served warm. 1. To toast walnuts, spread in a single layer on a sheet pan. Bake at 350° F for about 10 minutes, or until fragrant and lightly browned. Cool thoroughly before using. 2. If your bananas are very ripe or almost black, use the lesser amount of sugar. If your bananas are under-ripe or just spotted with brown, you may want to use the greater amount of sugar. 3. Feel free to substitute another liquor or liqueur for the bourbon if you like. Kaluha, brandy, rum, Nocello, amaretto, crème de cacao, or crème de banane would all be excellent choices. It can also be omitted if you prefer. For the record, it does turn out well. Without fail.